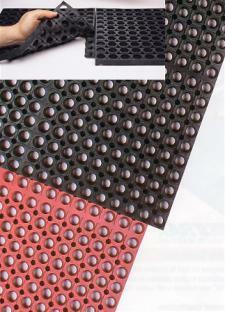 Use anti-fatigue mats to combat foot injuries. Foot injuries can not only sideline someone from completing their duties, but it could also lead to a loss in productivity if the issue lingers. It’s important to pay attention to the feet when thinking of different worker safety areas of focus. Occupational Health and Safety reports that preventing foot injuries should be a priority for employers, as they are one of the most common issues to happen while on the job. It’s critical to educate employees on ways they can keep themselves, and their coworkers, safe as they try to navigate the common hazards of the workplace. The news provider reports that jobs that are physically demanding, such as working in manufacturing and spending a lot of time on your feet, can be grueling. In these scenarios, add anti-fatigue mats to the floors in an effort to provide both comfort and traction to the floor. Also educate your employees on proper footwear. According to Web MD, even if you feel your feet don’t grow, the shape of your feet changes, which could leave shoes feeling painful. Managers should educate their employees on this issue and have them outfitted for shoes on a routine basis to make sure they’re not causing excess harm.